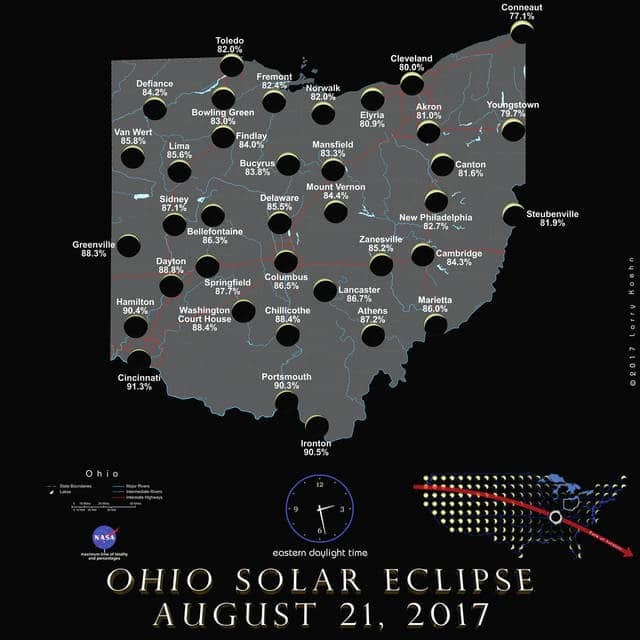 This map shows how much of the sun will be obscured at various locations in Ohio during the solar eclipse on Monday, Aug. 21. In Delaware, about 85.5 percent of the sun will be obscured by the moon passing in front of it. According to Perkins Observatory Director Tom Burns, the eclipse will begin at 1:04 p.m. locally and last until about 4 p.m.
How much of the upcoming total solar eclipse will Delaware County residents be able to view? Tom Burns, director of the Perkins Observatory at Ohio Wesleyan University, gave this preview of what local residents will observe when the eclipse occurs on Monday, Aug. 21. According to a NASA eclipse map of Ohio, the moon will obscure about 85.5 percent of the sun over Delaware. In Columbus, obscuration is estimated at 86.5 percent. Farther north in the Buckeye State, obscuration will be less. For example, it’s estimated that in Cleveland, 80 percent of the sun will be obscured by the moon, while in Toledo about 82 percent obscuration will occur. In Southern Ohio, obscuration increases. It’s projected that Cincinnati residents will experience 91.3 percent obscuration. It’s estimated at 90.3 percent in Portsmouth and 90.5 percent in Ironton. Only people who live along a 70-mile wide swath of the United States — known as the path of totality — will be able to view the total eclipse, which is expected to last about two minutes. That corridor begins in Oregon, runs through some of Rocky Mountain states, a portion of the Great Plains and Midwest before diving southeast through portions of Kentucky, Tennessee, Georgia, North Carolina, and South Carolina. Eye safety is of paramount importance when viewing a solar eclipse, Burns said. Perkins Observatory is selling solar glasses at Half Price Books locations in Central Ohio. Informational brochures about eclipses are also available. The Delaware County District Library is providing eclipse safety glasses to its patrons at no cost. Patrons are invited to stop by a local branch and either show their DCDL card or register for a library card to receive the glasses. Supply is limited. Burns said he’ll view the total eclipse in Sawtooth State Forest near the town of Stanley, Idaho. He said it’ll be the second time he’s witnessed a total solar eclipse. Gazette reporter D. Anthony Botkin plans to view the eclipse in Goodlettsville, Tennessee. It’s located just north of Nashville in the western part of the state. Goodlettsville, according to NASA maps, is just south of the center line of the total eclipse. Botkin said he previously viewed a total eclipse when he was a child living in Muncie, Indiana. Unfortunately, Perkins Observatory will be closed on the day of the eclipse. According to its website, no public viewing will be allowed on the observatory’s property. Information about the eclipse, including maps of states along the eclipse path, is available at shadowandsubstance.com. NASA has devoted an entire website to the eclipse at eclipse2017.nasa.gov.